Lee didn’t quite know why he was asked to come to the office on a rainy Wednesday afternoon, but he had heard that ‘there was something in the pipeline’… And so there was, because Lee has won Alpha People’s first Employee of the Month Award. Congratulations from all of us! Lee has been working for us for nearly 3 years and we are very grateful for all the work he has done for us. It doesn’t happen very often that a temp stays in his/her job for such a long time. ‘Lee drives our small transit van, collecting difficult access properties and any missed collections. Lee will also receive numerous calls throughout the day, from the Supervisors, asking him to undertake other tasks. Lee always undertakes his work with good humour, a smile on his face and provides good customer services. We three Supervisors all said Lee, without any debate. 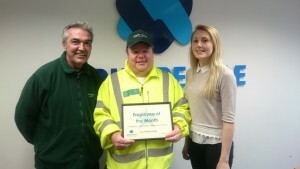 We would like to thank both our Client and Lee for their input into Alpha’s first Employee of the Month Award. We’re already looking forward to next month’s nominations. And, although it goes without saying, keep up the good work Lee!